Last week the CFF attended a Stakeholders Briefing on the Trans Pacific Partnership (TPP), a treaty that will affect copyright in New Zealand, the United States and other nations. New Zealanders have just spent in excess of $600,000 to develop an …How TPP affects NZ artists and what the US wants our police to do next http://creativefreedom.org.nz/2012/how-tpp-affects-nz-artists-and-what-the-us-wants-our-police-to-do-next/ Last week the CFF attended a Stakeholders Briefing on the Trans Pacific Partnership (TPP), a treaty that will affect copyright in New Zealand, the United States and other nations. New Zealanders have just spent in excess of $600,000 to develop an enforcement regime (apparently for the benefit of Rhianna) in the Infringing File Sharing Act, but more changes are on the way that affect public and artistic rights. • An expansion of copyright duration to: death of the author plus 70 years, or 105 years from date of publishing for sound recordings and film. The TPP is an international trade agreement currently being negotiated by NZ, the US, Australia, Chile, and several other pacific nations. It’s been described as a bill of rights for corporations, but this comes at a cost for artistic rights and wider public rights. Through this process the New Zealand government is keen to build and maintain it’s political ties with the US, hoping to gain better access to US markets for it’s agricultural industry. Further down the line, New Zealand hopes that such an agreement would be joined by other big and valuable players (Japan, India etc). The US believes that it will protect a major export of theirs: copyright. The next round of negotiations are happening in Melbourne in early March and there is a push to conclude negotiations by the end of this year. 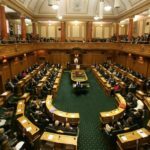 Depending on the timing of TPPA negations wrapping up, New Zealand may delay its 2013 review of the copyright act in order to first focus on the TPP. Texts for the intellectual property chapter in the TPP have been proposed by several nations. In 2011 earlier proposals from the US, NZ and Chile were leaked. As with ACTA – which is currently being met with significant criticism and protest in Europe – this treaty is being negotiated behind closed doors. 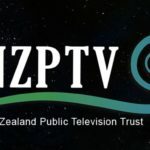 Prior to entering negotiations the NZ government and all other participants signed up to a confidentiality agreement that will keep all discussion documents secret until four years after the agreement is either entered in to, or negotiations cease. In the past US officials have made extraordinary assertions such as claiming a direct link between copyright infringement online and the funding of terrorism. These allegations have never been substantiated, however if they were introduced in a discussion document the lack of public scrutiny could see them go unchallenged throughout the negotiations. 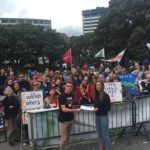 There is a significant inability for affected stakeholders and experts, such as NZ artists, to comment on the treaty with accuracy and in depth without having access these documents. 2.	the US model (referred to as “ACTA Plus” and the “standard US template”). As seen in ACTA, and other US-endeavours to influence NZ copyright lawmaking, the US are pushing for aggressive and heavy-handed copyright regimes. This has huge potential to harm the way New Zealand artists work and use the internet to connect with overseas markets. It has the potential to unfairly harm public rights and respect for copyright, artists and their work. Because copying occurs in private homes on private internet connections it’s essential to have publicly respectable copyright law, because laws that don’t earn public respect ultimately harm artists. •	Increasing civil punishments (statutory or triple damages) and ensuring mandatory sentences that remove the current right of a New Zealand judge to use their personal discretion. Heavy handed regimes like this can have a “chilling effect” on innovation and creativity because they create massive risks for anything that touches copyright, including new artistic works, and they remove public rights in favour of copyright (such as the effective removal of Fair Dealing under the proposed changes to DRM/TPMs). • the issue of increasing DRM protectionism effectively removing public rights that we currently have under Fair Dealing laws. Support us: we are a not-for-profit organisation running primarily on volunteer energy. Help us keep doing what we do by donating to the CFF. Spread the word: tell your friends about this, either in person or through social media. Like the CFF Facebook page or follow us on Twitter. Use the hashtag #tppa on Twitter when talking about it.